Laoconnection.com: Know All Your Lao Airport Codes? There are currently 18 airport codes for Lao PDR according to the IATA website. However according to a number of other websites, there are reportedly others bringing the total to as many as 24. 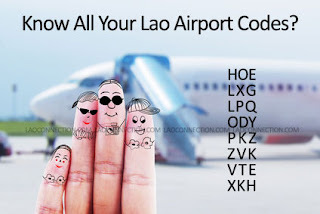 Furthermore, out of the 18 airport codes listed below really only 8 airports are still in regular use in Laos including HOE, LXG, LPQ, ODY, PKZ, ZVK, VTE, and XKH, as those locations are still being serviced by Lao Airlines. Meanwhile, Lao Central Airlines really only flies between VTE, LPQ and Bangkok (BKK). Laos currently has 3 international airports which include VTE, LPQ, and PKZ - a 4th one is on the way. Vientiane Times reported on January 18 2012 that a construction deal between the government and a Chinese firm to build a new international airport in the Golden Triangle Special Economic Zone had been approved. It is specifically planned for Tonpheung district, Bokeo province. The completion date is unknown. The rest of those listed may still have landing strips but no operating airports. Essentially they are no longer used or are defunct and several were set up and used only during the war years. For example, Vangvieng used to have an airport though now all it has is an unmaintained landing airstrip. And as you can see from the list below, it was misspelled/mispronounced as Vangrieng and given code VGG. For any cities not serviced by air travel the deficiency is made up by bus service. The buses run pretty much throughout the entire country. Did you figure out all the airport codes mentioned above? Find the answers below. IATA = International Air Transport Association. Current IATA 3 letter codes were confirmed on March 18 2013 at the IATA website. ICAO = International Civil Aviation Organization also gives the internationally recognized 4 alpha numeric location and airport codes though for simplicity only the IATA codes were shown in this post as they are most commonly known and used.